Use a fire bowl as a fantastic focal point in your backyard with the Esschert Design Cast Iron Terrace Screened Chimenea. Placing a chimenea on your patio turns it into a gathering spot in moments, and the familiar shape of this piece adds traditional style. The rounded fire chamber and extended chimney capture attention easily, while the cast iron construction ensures durability. Screening along the center of the fire chamber keeps the flames contained, and a 12" wide door allows you to add logs or charcoal to this section. Place the included, 12" diameter grate inside the chamber for air circulation and even burning. The tall chimney adds drama to this item, while keeping smoke away from your gathering, and its included cap prevents rain from ruining the fire. Attach the three, 6.5" long legs to the pot, elevating it from the ground for safety. The rust finish lends an antique look to this unit, and its cast iron body remains warm long after the fire is out. 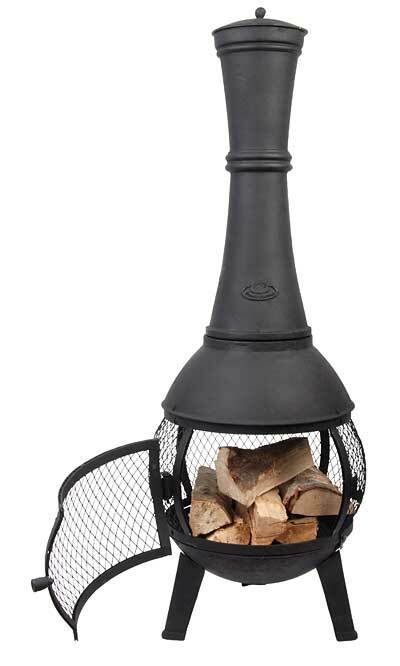 Bring a stunning outdoor fireplace to your garden with this Cast Iron Terrace Screened Chimenea. Assembly required. Note: This item is designed to patina naturally. You must apply a heat resistant paint to the item to prevent this process from occurring.